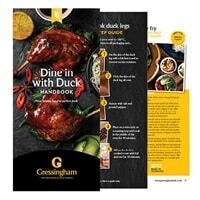 Gressingham Duck is giving away free duck recipe book containing dozens of delicious duck recipes. All you have to do is go to their website and then scroll down to the form, make sure to click on the Request hard copy button and then fill out the form to receive it via mail. Click on “GET IT HERE” button and then follow instructions given above to receive a free hard copy of duck recipe book.